Floyd Mayweather Jr. continues to contend that he does not have time for Manny Pacquiao. Regardless of his excuses to not enter the ring with the “Pac Man” he seems to have just as many to avoid facing off in court. Mayweather has refused to appear for any of the 24 dates the Pacquiao legal team has offered thus prompting the Motion for Default Judgment and Dismissal which was filed earlier this month. The litigation stems from a suit filed by Pacquiao in late 2009 against Mayweather for Defamation regarding statements made asserting that Pacquiao’s success in the ring was due to use of performance enhancing drugs (P.E.D.s). Other defendants also named include Floyd Mayweather Sr., Roger Mayweather, Mayweather Promotions, LLC., Richard Schaefer and Oscar De La Hoya, though claims against Schaefer and De La Hoya were recently dropped earlier this year. The final straw prompting the Motion to Dismiss broke on June 17 when Mayweather was ordered by the court to be give testimony. The deposition would have required him to submit to oral examination under oath regarding the defamatory statement he made against Pacquiao. On that day Mayweather was no where to be found. There is no doubt that Mayweather was not going into to the deposition willingly. Earlier in the week Mayweather’s counsel filed an emergency motion to postpone the testimony. His attorney Mark Tratos also sent a letter to Pacquiao’s attorney Dan Petrocelli informing him of the appeal and that Mayweather would not be in attendance. The motion to postpone was denied, meaning that Mayweather was legal compelled to be present for the deposition. His contention in the appeal was that he needed to concentrate on his upcoming bout against Victor Ortiz on September 17, exactly three months away at the time. The Ortiz fight has recently become Mayweather’s favorite excuse for avoiding court. Mayweather is an undefeated professional boxer and all competitors have their own method of training. Mayweather has accused Pacquiao of intentionally interfering with his training regime, which apparently differs slightly from the traditional method of strength, cardio and technique, focusing more on partying and socializing. The 15 page document filed by Pacquiao’s legal counsel includes evidence exhibits containing photos of Mayweather at parties in Atlanta and Las Vegas during several of the time periods which he asserted he would be unavailable to be deposed. 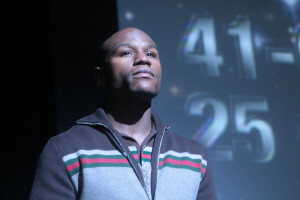 The motion provides virtually a day by day account of Mayweather’s activities during the proposed deposition dates, none of which include an unforgiving training schedule. One of the dates includes rapper 50 Cent’s birthday party. Others include a number of parties the boxer hosted or encouraged others to attend via his Twitter account. The photos include promotional flyers for the nightclub parties in Atlanta, shots of Mayweather handing out champagne bottles and even one of him burning what appears to be U.S. currency. “Mayweather is not above the law,” Petrocelli told the Associated Press in an interview. “He’s essentially forfeited his right for a defence” by not appearing at the depositions. Under Federal Rule of Civil Procedure 37 regarding failure to make disclosures or cooperate during discover, Pacquiao and his attorneys are asking the judge to enter a default judgment against Mayweather and for reimbursement of all attorney fees incurred by Pacuqiao. The introductory paragraph of the Motion for Default Judgment and Dismissal sums up Mayweather’s obvious disregard for the judicial system. Mayweather has spent approximately 18 months avoiding deposition according to Pacquiao’s legal counsel. During this time he has also continued to make the defamatory statements which inspired the litigation. They expect a decision soon.